Reference number for this case: 19-Oct-54-Eu. Thank you for including this reference number in any correspondence with me regarding this case. In 2003 on a ufology discussion board of the web, "Uncle Dom", i.e. the veteran and "skeptical" ufologist Dominique Caudron, told that at the time of the 1954 saucer flap, there was the case "of a pathetic shaky light observed by a girl who lived above a movie theater." He says that this was reported like this by the small local newspaper, but the local issue of the "Courier Picard" made of it an a little richer report already. Mentioned in another regional newspaper, it was still better, and it then was reported in the "Parisien Libéré." He says that "in the end," in Jacques Vallée's catalogue" - where actually this case does not exist - "it becomes two squadrons of flying saucers which echanged signals. Two more steps and you would get the War of the Worlds:-)". On October 19, 1954, from 9:30 p.m. to 11:30 p.m., a lady and her daughter over 18 were at their window, a dwelling that was an outbuilding of the castle of Eu, raised 12 meters above Boulevard Hélène. In the direction of the Côte d'Ault, also called Côte Saint Valéry, about 1500 meters from their point of observation, they observed bright gleams appearing to come from a spot on the ground. The night was very dark, there was wind and it had rained heavily. The lights became stronger and stronger and dazzling, their source remaining fixed. At one point luminous spots were thrown from the source in various directions, these "rockets" formed red circles, spinning and returning to their starting base. This "luminous ballet" seems to have taken place exclusively on the ground. The gendarmerie indicated that the women "are not subject to hallucinations, they are calm and sensible", the girl was raised at the College of Eu until the age of 18, had her "Brevet d'Etudes" and spoke English and German. Other people had seen unusual lights from the Pont Route on the Bresle in the direction of the Côte de Saint Valéry, but they could not observe the "ballet". The gendarmerie had consulted a chief electrician of the national power company E.D.F., who thought that at the place indicated, two high voltage power lines crossed in the fields, and that the humidity resulting from the heavy rain could have provoked a powerful electric arc and several colors. He did not explain the phenomenon of the spinning lights. observed by a young girl who was residing above a movie theater. by the loacal edition of "le Courrier picard", it is lready a bit richer. come to the "Parisien libéré". of flying saucers that exchange signals. 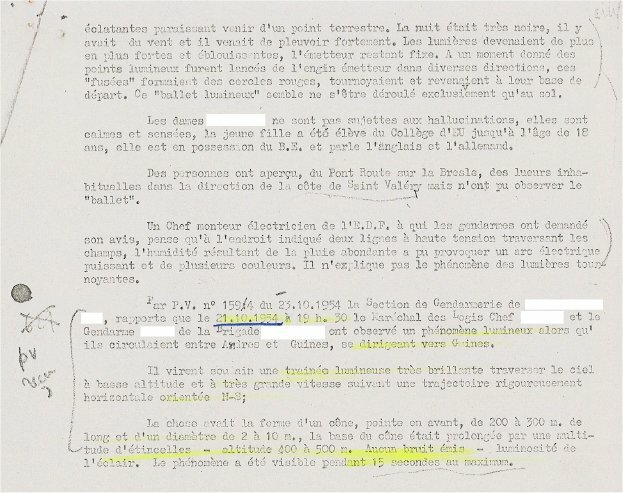 Although Dominique Caudron [dc1] says this case appears in Jacques Vallée's catalogue as "two squadrons of flying saucers that exchange signals", there is no French 1954 case that matches this in Vallée's catalogue as far as I know. The chances are great that this was, as suggested by the E.D.F. person, a case of electric arcs between crossing high voltage power lines. 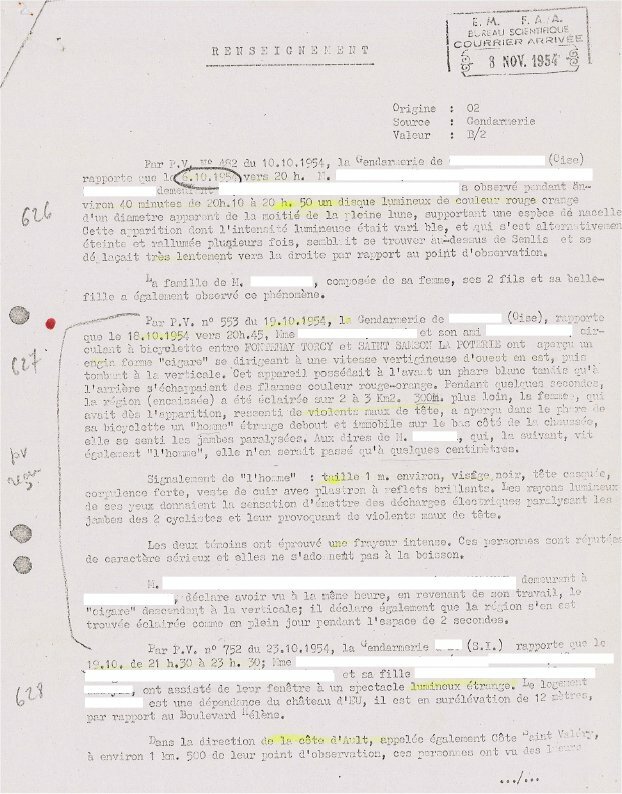 [gn1] Information sheet by the Gendarmerie Nationale, November? 1954, published by the GEIPAN in 2014. [---] Article in the regional newspaper Le Courrier Picard, France. [---] Article in the national newspaper Le Parisien Libéré, France. [dc1] Posted by ufologist Dominique Caudron, France, on the Internet forum francom.ovni, July 3, 2003. 1.2 Patrick Gross January 21, 2017 Additions [gn1], in the Summary, addition of the parapgraphs starting at "Subsequently, I found, published by the GEIPAN". Date changed from "1954" to "October 19, 1954". Explanations changed, were "Not looked for yet."